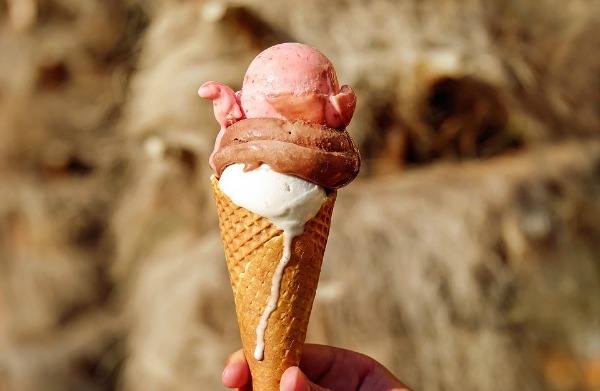 This delicious ice cream cone may be intimidating if you have sensitive teeth! Does biting into an ice cream cone make you wince? Does a slice of pizza bring you more pain than pleasure? You might be suffering from tooth sensitivity. A visit to the dentist may be the sweet treat you need to indulge in a healthy, pain-free smile. Think about everything you put your teeth through each day: that’s a lot of chomping, drinking, biting, and temperature fluctuations! Your tooth enamel provides a hard layer of protection for your teeth. Given the chance to wear down over time, you may find yourself with sensitive teeth. Pain felt while consuming hot or cold foods can be caused by brushing too hard, using hard-bristle brushes, teeth grinding, consuming sugary and acidic foods, or receding gums. Tooth sensitivity is an indication that you may have an oral health issue that needs professional care. How Can I Heal Tooth Sensitivity At Home? Your daily habits, diet, medical history, dental hygiene, and even your genetics play a part in deciding what your future of dental health will be. Go easy when brushing your teeth. Overly vigorous brushing, especially in a side-to-side motion at the gum line, can make your enamel erode at an accelerated rate. Position your soft-bristle brush at a 45 degree angle to reduce erosion. Curb the sugary drinks and foods. A sticky film of plaque collects on your teeth when you eat sugary foods, and begins the decay process. Overly acidic foods and drinks attack the enamel. Instead, choose crunchy, watery vegetables, cheese and nuts to increase saliva production. Your saliva helps wash away bacteria and decreases the chances of a dry mouth. Stop clenching so much! Grinding your teeth and clenching your jaw can wear away your enamel. Teeth grinding has serious cosmetic and restorative consequences. Even if you don’t know that you are grinding your teeth, ask your dentist–you may need a small mouthguard to wear while you sleep! Are you whitening incorrectly? While drugstore teeth whitening products are certainly effective in removing some stains, they have been known to increase tooth sensitivity or leave mixed results. Professional teeth whitening is specially formulated to reduce tooth sensitivity while boosting brightness at a level that cannot be achieved from a drugstore kit. Tooth sensitivity can also be a sign of a more serious health issue, like gum disease (also known as periodontal disease). If your gums look like they are receding, it may be a buildup of plaque and tartar that is pulling the gums back and increasing sensitivity. A broken tooth may expose the inner root of the tooth to debris and bacteria, which causes pain and sensitivity. A small crack can generally be fixed with the use of a protective dental sealant such as with fillings, inlays or onlays. As your local family dentist, Dr. Priti Naik is committed to reducing and preventing dental issues such as tooth sensitivity, cavities, tooth decay and gum disease by encouraging quality preventive dental care. Our team is thrilled to provide regular six month cleanings and comprehensive dental exams for our patients as well as monitoring oral health, and offering education for better at home care and daily choices. Call us today at (703) 288-1800 to schedule your appointment and meet our friendly and caring team!